Very nice hostel. Very clean and with a good kitchen. We were staying in a private room with private bathroom. The room and bathroom were great (very nice big bed and good hot showers). Wifi is not always the best when many people are in the hostel, but you can switch between multiple servers to try to get a better connection. Location is also great, it is just a few blocks away from everything. This is a very central hostel, run by a lovely family. Everything is really clean, you can use the communal kitchen. It was a bit quiet when I stayed there, but I would overal recommend this place. 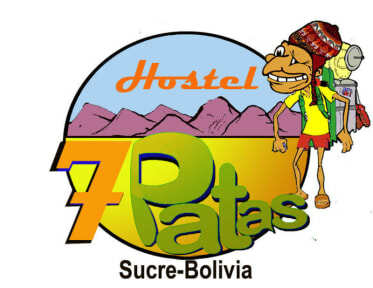 Very good hostel, especially for this price! Good showers, close to the market and the plaza, nice patio, and clean. Wifi is not working really well, but that's in almost every hostel. The reception sells eggs and other stuff. Great place! In de meeste opzichten een prima hostel. De goedkope wasserette (10 Bolivianos) was een verademing, locatie is top en de prijs/kwaliteit verhouding is super. Enige commentaar wat ik heb is de waardeloze WiFi die het af en toe uren niet deed. Nice atmosphere and staff. Bathrooms where occupied a lot of the time. Good location. Beds are not that comfy. We arrived very early and because the room was available already, we could check in and sleap a bit. I don't expect this from hostels but always super nice if they do this. Also no problem to leave our bags and stay after our checkout. Great location and nice rooms! 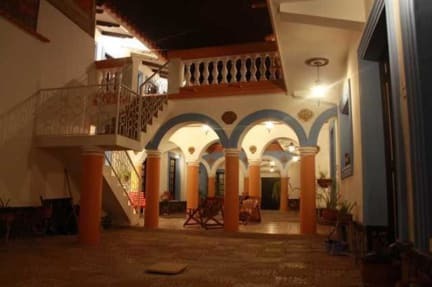 7 Patas is located in a beautiful building in the center of Sucre. The courtyards are a great place to chill in the sun. The crowd is mostly people doing Spanish lessons, so not the most social. We had a private room, which had a great closet & bed, but could do with some real curtains (we ended up putting our beach towels on the windows because they were so see through). Kitchen is well equipped, and liked the activities board in reception. Nice clean hostel close to the city centre. Good value for our money. Matress was very thin. Bathrooms have blurred windows in the doors and showers have no curtains, so I felt a bit uncomfortable when showering. However, the location is great.